It was a slow day at Train Town when my sister and I, the only passengers, reached the halfway point in the ride. The teens operating the train stopped and said, "Let's go and feed the geese!" Just a young nipper at the time, I didn't trust the train to not leave without us. I refused to budge from my seat. Later, I felt foolish. The small moment grew larger in my mind, symbolizing a fear of jumping out and participating in life. As for Train Town itself, it's still there, marked by a bright yellow tower a mile south of Sonoma. And children are still cheerfully climbing all aboard. Since the 1970s, Train Town has grown up a bit, too. They've added a merry-go-round, a Ferris wheel and other rides. The geese have been joined by hungry goats. Ambitious model railroader Stanley Frank began work here in 1958, opening the gates 10 years later. It's still owned by Frank's children and grandchildren. 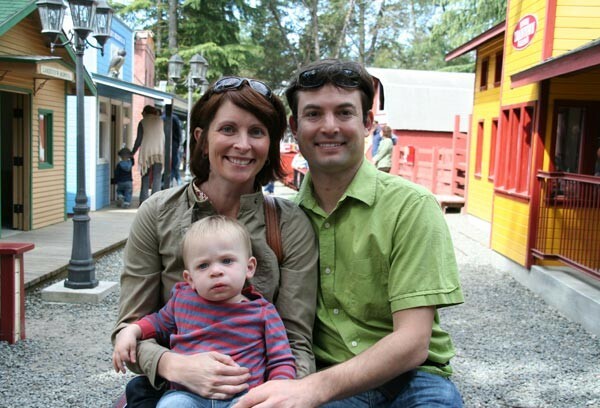 His son, Robert Frank, speaks fondly of the Lilliputian town that visitors and families (like Alissa, Rowan and Geoffrey Smalling, above) tour in the middle of each 20-minute ride. "Lakeview is a very quiet little town," he says, listing off the town's miniaturized amenities, which include a school, firehouse, livery stable, jail and public outhouse—"a twin-holer." Seven of the engines are fully licensed and inspected steam locomotives; two are diesels. The craftsmanship of the quarter-scale reproductions is of interest to grownup enthusiasts, while engineer caps are a souvenir-stand favorite for the kids. Train Town also works with Make-a-Wish Foundation to bring a day of brightness to children living under the shadow of terminal diagnoses. On one occasion, a boy got to take the controls in the engineer's seat. Afterward, he said that driving the locomotive was the first time he felt he had a genuine feeling of strength and power. When children's wishes have been carried out, Frank says, with a catch in his otherwise matter-of-fact voice, "I never get quite used to it." Could there be a more genuine testimonial for what adults see as a simple amusement park? From the wide-eyed perspective of generations of young nippers, it's much more than that. 20264 Broadway, Sonoma. 07.938.3912.—J.K. Crunching down the gravel path, the gaggle of first-graders eagerly search the rambling, overgrown garden for cocoons, or better yet, a colorful butterfly. At Hallberg Butterfly Gardens in Graton, suspected to be the oldest butterfly garden in the county, visitors might spy monarchs, painted ladies and pipevine swallowtail butterflies by the dozens. Reigning butterfly monarch Louise Hallberg gives tours in the nine-acre patch that has been part of the family farm since 1906. Hallberg has lived here all her life and, now in her 90s, continues to track the flora and fauna in her sprawling garden. A great place to get outside and buzz around, the garden also provides a picnic area for hungry, hungry youngsters. 8687 Oak Grove Ave., Graton. 707.823.3420.—S.D. Want to get weighed? Head to Frizelle Enos Feeds, where colts, sheep, pigs, goats and even snakes have tipped the scale inside Sebastopol's longest running business in west Sonoma County. Built into the floor when the store was constructed in 1939, a grand Fairbanks Springless scale is still in use for anyone or anything up to 1,000 pounds. Originally used for livestock, feed and coal, the highly calibrated scale now also weighs pets, packages, luggage and entire classes of school kids. "I even rode my little filly onto the scale when I was a teenager," says longtime employee Julie Seth. "One guy brought in a huge, gorgeous yellow python," says salesclerk Judy Overshiner. "First, he weighed himself, then put the snake around his neck and weighed himself again." Wildcat handlers have weighed the cages of leopards and mountain lions, empty then full. Don't forget to enjoy free freshly made popcorn while perusing the 19 types of bird feed, gerbil toys or rain boots with ponies for little feet. Best of all, peek at real live peeps inside warm, cardboard coops toward the back of the store, munching on their own corn and hardly weighing an ounce. 265 Petaluma Ave., Sebastopol. 707.823.6404; also 100035 Main St., Penngrove. 707.992.0144.—S.D. While some could argue that Levi's jeans aren't as hip as they once were, the iconic denim duds have roots that stretch back to St. Helena, circa 1879. Hungarian immigrant Abraham Goodman is said to have sold the first pair of Levi's jeans in Napa County out of his pioneer dry-goods and ready-to-wear shop Goodman's, on the St. Helena strip. The store eventually moved to the architectural-wonderland-of-a-building on the Richie block, and with its domed clock tower, the building facade alone is worth the trip. Step inside and there's everything from caps and tees to souvenirs and gift items, but the real draw will always be the mystical and stony nature of the building with its high-in-the-sky steeple, forever reminding us that newer isn't always better. 1331 Main St., St. Helena. 707.963.1750.—C.J. Toby's Feed Barn was built in 1976, but its roots run further back than that. In 1942, Toby Giacomini started trucking milk and cream from the dairies of West Marin through San Rafael and over the San Francisco Bay; eventually, he began supplying farmers with feed and grain as well. By the time the barn opened on Main Street in Pt. Reyes, his family was well established in the agricultural community, and selling produce, kitchen wares, plants and pet food was a natural next step. 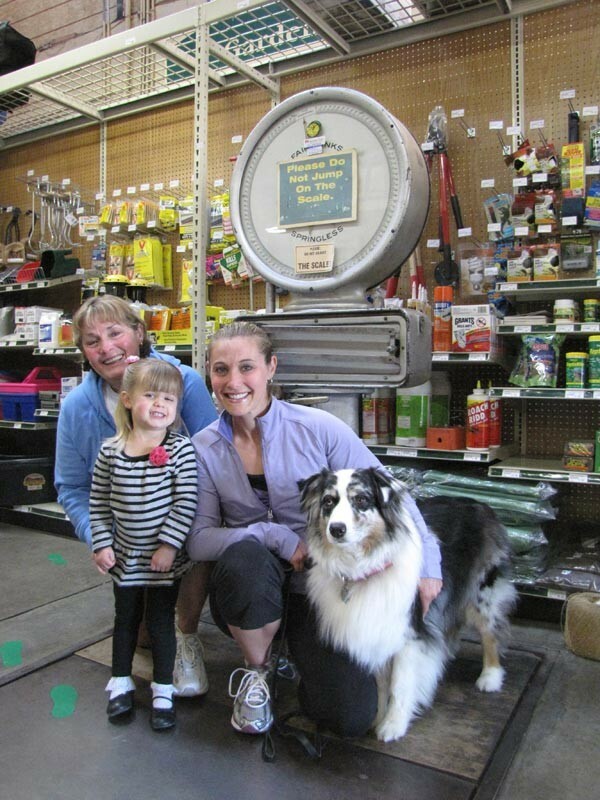 Now a community hub with author readings, a coffee bar, farmers markets, an art gallery and a yoga center, Toby's Feed Barn has earned and transcended its title as Best Feed Store. 11250 Main St., Pt. Reyes Station. 415.663.1223.—R.D.